The north front of the U.S. Capitol in Washington is locked down after a shooting, April 11, 2015. Law enforcement officials say the U.S. Capitol building was locked down for a few hours as a precaution after shots were fired when a man killed himself outside the building. Capitol Police spokeswoman Kimberly Schneider described the suspected shooter as "neutralized" after a self-inflicted gunshot. Officials later confirmed the man was dead. She said police are also investigating a suspicious package on one of the building's terraces. During the lockdown, no one was allowed to enter or exit the U.S. Capitol Building. The incident comes during the National Cherry Blossom Festival, one of Washington's busiest tourist events. 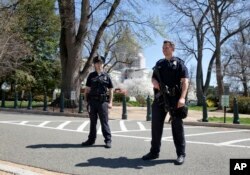 Law enforcement officers keep watch around the north front of the U.S. Capitol in Washington. The building was locked down after a gunshot sounded, April 11, 2015.